From the Janitorial Direct own brand this Rinse Aid is ideal for use in commercial kitchens. This product is safe to use on crockery and cutlery in automatic dishwash machines. It is used after the cycle wash and rinses dishes to leave them sparkling clean; as well as helping to speed up the drying process. It comes in a 5 litre bottle and is available to buy online and can be bought as a bulk buy option. This Granular Salt Water Softener is ideal for use in hard water areas to make water softer. It is an easy to use product that has been formulated to prevent undissolved salt from building up in the base of your water softener. It can be used in all makes of water softener. It comes in a 25k bag that can be bought online; it can also be bought as a bulk buy option. This Granular Salt is ideal for use in commercial kitchens and workplaces. Used in the correct dishwasher it offers a powerful clean that removes grease and grime easily and effectively from dishwasher safe plates, glasses, cutlery and kitchen utensils. It comes in a 2kg bag and can be bought online as part of a bulk buy option. 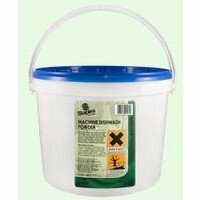 Extremely effective in both hard and soft water areas. Will clean not only day to day dinnerware(if dishwasher proof) but also glasses and cutlery. Contains a powerful sterliser which which will kill most bacteria. Free flowing white powder for use in commercial and domestic automatic dishwashing machines. For use in domestic machines: Soft water – 1.5oz per gallon. Hard water – 2oz per gallon. Commercial spray type machines: Soft water – 1.5oz per gallon. Hard water 1oz per gallon. Do not use on lead, crystal or aluminium.